Kyrenia is a little known town situated in Northern Cyprus. You’ve probably never heard of the place and it’s unlikely to have made it onto your bucket list – but that’s not to say it shouldn’t have. From beautiful natural marvels; to historic sites and breath taking majesty, Kyrenia has certainly earnt its place on the map. Cyprus is an idyllic country – better known for tourist spots such as Nissi Beach, Paphos and the many picturesque caves and coves which adorn its coastline – but Kyrenia has Cypriot charm in abundance. Saint Hilaron Castle is located in the upper mountains of Kyrenia and has maintained its majestic watch over the stunning countryside for centuries now. Trips to Saint Hilarion are arranged frequently from the main town and once entered it’s easy to see why – the archaic castle welcomes you into its ruins; offering multiple viewing points across the surrounding mountain ranges and some truly breath-taking landscapes. About 5 miles outside of Kyrenia, you’ll find The Bellapais Monastery – which is well worth a visit for any enthusiastic history buffs. This 13th century monastery sits side by side with modern North Cyprus: perfect for those less historically inclined with a couple of hotels such as Bellapais Monastery Village and Bella View hotel nearby. In its earlier days the Bellapais Monastery earnt the epitaph ‘The Monastery of Peace’ and this atmosphere still reigns today within its tranquil grounds; peaceful and picturesque in their decay. For something truly memorable, head here in early summer to catch a glimpse of the refectory concerts and musical performances. They even host an annual local music festival; it’s a far cry from the muddy fields of Glastonbury and definitely something to see if you’re in the area. What better to do on holiday than eat, drink and be merry? Well, if that’s what you’re after – look no further than the harbour, where the freshest fish and choicest ingredients are used to create traditional Cypriot dishes and a wide array of other cuisines. After lunch, how about a relaxing stroll down the harbour? Home to shops and a wide range of things to see and do. The harbour is the long serving hub of the city where you’ll see locals of all ages meeting up with friends and family, enjoying the food and enjoying their city. Turtles are fantastic creatures – who doesn’t love them? Ungainly, mysterious animals; not often seen outside of zoos and children’s books, these ancient reptiles have lived on the earth (or under the sea) for millennia – which is why it’s always worth catching them in their natural habitat. Alagadi boasts the longest stretch of beach on the whole of the Cypriot coast, so if there’s one place you’re likely to see Turtles it’s here. And if that’s not convinced you, this is one of the few beaches still used by turtles for nesting, so show up at the right time of year, and it’ll be extremely difficult not to see one. 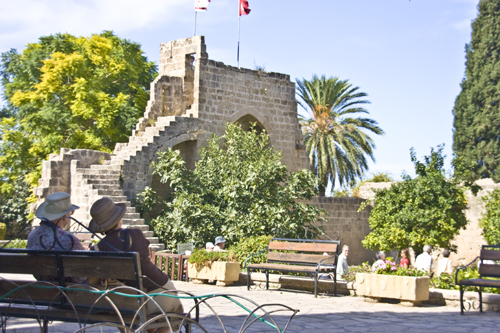 If you long for adventure you’ll love Kyrenia’s period city walks and tours – taking you on a guided tour of the city walls or towers and offering unique glimpses into the past. We won’t give too much away as the tour guides do a wonderful job of setting the scene and sharing the stories of their cities history – but suffice it to say, this is a city walk which will stick with you long after you leave the ancient walls of Kyrenia behind. Of course, there are plenty of things to see and do in Kyrenia which we’ve been unable to cover on this list – but we hope we’ve shown you how much this city has to offer and encouraged you to stick it on that bucket list! Great advert, but IF there is a settlement and direct flights, the World and his wife and the Aya Napa brigade will be there!! !